My dream-ticket recordings of these concertos from Arthur Rubinstein with Symphony of the Air/Alfred Wallenstein (Sony/RCA Classical Masters 88691928082) are now sounding rather long in the tooth. That said they are far better on CD or as a download than they ever were on LP where the orchestra often sounded thin and crumbly. For all the defects of the recordings, SB2145 and SB6797 were among the last LPs that a burgeoning CD collection forced me to discard. That RCA recording also comes at an attractive price - not all UK suppliers seem to stock it but those who do offer it for around £6. It’s also available for £3.99 as a 320kb/s mp3 download from Sainsbury's Entertainment. At those prices these should be in every collection whatever other recordings you choose. There’s another RCA reissue in which the first concerto comes in the recording with the NSO and Stanislaw Skrowaczewski - see November 2010 Download Roundup and review by Ian Lace. Amazon’s price for that has risen to a still very reasonable £4.49 since 2010. Another inexpensive recording which I like came in a Hyperion reissue in Chopin bi-centennial year: Nikolai Demidenko (piano), Philharmonia Orchestra/Heinrich Schiff - rec April, 1993. DDD. Hyperion Helios CDH55180 [72:06] - (budget-price CD, mp3 and lossless download for £4.99) - see April 2010 Download Roundup. Though it received mixed reviews when it was first released, it makes a good alternative to Rubinstein or to Martha Argerich/Charles Dutoit (EMI/Warner) or Krystian Zimerman (DG, as soloist and conductor or the earlier DG recording with Giulini, now download only) and, in No.1 alone, Maurizio Pollini/Paul Kletzki (EMI/Warner) - see February 2010 Download Roundup. With so many first-rate recorded performances of varying vintages and in different price-ranges did we need another recording? Emphatically yes, if it’s as good as this new Linn CD. 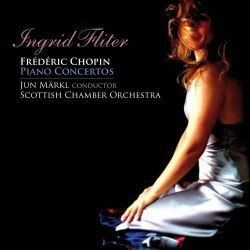 Ingrid Fliter has already made quite a reputation as an interpreter of Chopin’s solo piano music for EMI - review and review. Now she turns to the youthful concertos and makes an auspicious debut with a different label. There’s plenty of bravura and power in the outer movements without any sense of showing off and there’s poetry in the slow movements, even if the Romance of No.1 is taken noticeably faster than by Rubinstein on either of the RCA recordings that I’ve mentioned, though at almost exactly the same pace as by Argerich. The Larghetto of No.2, on the other hand, is rather slower than from Rubinstein without sounding drawn out. Look at the adjectives and nouns that Michael Cookson uses in his review of Fliter’s recording of the Waltzes and you’ll find them all equally appropriate to various aspects of these concertos: glittering, feather-light and fleet-footed, playful, yearning and sorrow. Do I still plan to listen to Rubinstein and to Pollini in No.1? Does Argerich find a little more magic in both concertos? Is Stefan Askenase with Leopold Ludwig (Beulah 3-5BX172, rec. 1960 - see DL News 2013/9) a little dreamier in No.2? Yes, but that’s only because I listened to them in direct comparison with the new Fliter recording. Hear them all on their own without comparison and they are equally convincing. The recording is a good deal firmer and more credible, especially in the lower frequencies, than the RCA Rubinstein, even in its re-mastered form. I thought the balance between soloist and orchestra almost ideal, so I was surprised as I was closing this review to see a suggestion that the piano is balanced too far forward. Thinking that I had, perhaps, been unduly influenced by listening to the Rubinstein first, where the piano certainly is forward in RCA’s house style of the 1960s, I listened again and still thought the balance credible. Certainly the soloist is the centre of attention but that’s Chopin’s fault, if fault there be. I listened to the CD-quality 16-bit download from eclassical.com and thought it very good. At current rates of exchange their price of $13.16 is very competitive with Linn’s £10 for 16-bit and you can come back for the mp3 for your personal player at no extra cost. If you are happy with mp3, Linn’s price of £8 is marginally your better bet. Linn offer 24-bit and SACD, too, for audiophiles at an extra but hardly exorbitant price. They throw in the booklet as well, which should also be available from Naxos Music Library when this joins the other Linn recordings there in the near future. The lossless downloads of the Argerich, Zimerman and Pollini recordings which I recommended from passionato.com are no longer to be had - that company is no longer in the download business, so the best you can obtain will be mp3 in the case of the EMI recordings. Deutschegrammophon.com have both the Zimerman recordings in mp3 and lossless, but their lossless version of the newer version is more expensive at £15.49 than some dealers charge for the CDs. One minor grumble: Demidenko plays Concerto No.2 first - despite the numbering it actually came first - and I prefer it that way. It’s possible to play the concertos in that order but it’s something of a fiddle having to programme the CD or re-number the tracks of the download.